This review of Jack Nicklaus’s autobiography and Mark Shaw’s biography of Nicklaus first appeared in the June 28, 1997 issue of Golf Week. If I were reviewing books on Nicklaus today, I would certainly mention Nicklaus’s first autobiography, written with the assistance of the estimable Herbert Warren Wind when Nicklaus was only 29. Its tone differs significantly from the Bowden collaboration, and naturally focuses more on Nicklaus’s amateur career, which was nearer his rear-view mirror in 1969. Jack Nicklaus, officially anointed as the player of the 20th century by the U.S. Golf Association at its centennial in 1994, has a pretty impressive record as an author, too. My Story is his 13th book, the seventh in collaboration with Ken Bowden. 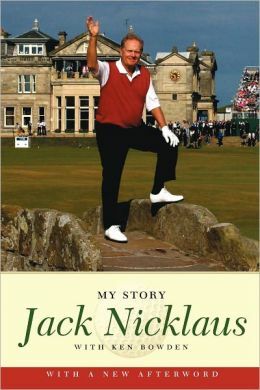 Though it contains nothing particularly revelatory, My Story amply chronicles Nicklaus’ success as a player, from his wunderkind years in Ohio – he won the Ohio Open as a 16 year old – through his stirring victory, as an “old man” of 46 at the 1986 Masters. Just as Nicklaus’ golf game was exceptional, his ability to scrutinize his and his fellow competitors’ play and analyze the courses where they compete is peerless, so there’s plenty of wisdom about the great game in My Story. Daniel Goleman’s 1996 best-seller, Emotional Intelligence, revealed how important emotional skills are for leading a healthy, productive life. When Jack Nicklaus discusses what he calls the “art of winning,” his analysis summarizes an athlete’s view of emotional intelligence. Winners share four qualities, writes Nicklaus: they can “think clearly under pressure;” they are “patient;” they are “self-centered” – that is, not selfish, but indifferent to “what other competitors may or may not be doing;” and they work hard, especially when things are not going well. This catalogue of attributes, which Nicklaus clearly possesses in abundance, really is the key to his greatness as a golfer, and explains how he’s been able to succeed as a businessman and golf course designer as well. He’s a focused, determined, realistic person – who happens to possess a great golf swing. Nicklaus changed the game in several ways, not least by asserting that successful careers should be measured in terms of “major victories.” He also was, like Tiger Woods, gargantuan off the tee. In 1963, for example, when he was 23 and about to win his first PGA Championship at The Dallas Athletic Club, Nicklaus won a long driving contest with his “longest officially recorded belt” – 341 yards, 17 inches, with a persimmon driver. In 1961, the year he won his second successive U.S. Amateur, he “smashed the fiber face insert out of my driver” nine times! Because Nicklaus had so much success over so many years, My Story is long, and the triumphs tend to blend together after awhile, so it reads best in small doses. A little editorial tightening might have helped, too – there’s a section at the end consisting of miscellaneous anecdotes that didn’t fit anywhere in the narrative. This is surely a product of the method of the book’s construction–Nicklaus recording his memories, Bowden shaping them. 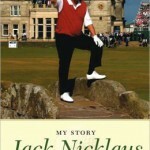 Nicklaus calls My Story a “complete and definitive autobiography,” and in a narrow sense, regarding his golfing career, that’s probably true. He closely guards his personal life, however, which he has every right to do. Mark Shaw’s hope to write a definitive biography of Nicklaus was hindered by his subject’s refusal to cooperate. What else would you expect from a man so famously competitive whose own book was about to appear? Hampered as it is by a heavy dependence of secondary sources, Shaw’s Nicklaus never has the sense of immediacy or the sure knowledge of place that Nicklaus himself brings to his own story. (Shaw places Pebble Beach in “southern California,” for example). Shaw focuses on Nicklaus’ run at a Grand Slam in 1972, the year he won the Masters and the U.S. Open, finished second at the British Open and tied for 13th at the PGA Championship. This presents narrative difficulties, given that Shaw also wants to summarize Nicklaus’ entire career and examine his achievements in golf course architecture. (Shaw was Pete Dye’s co-author on Bury Me in Pot Bunker.) He relies heavily on Golf Digest’s Ron Whitten for his analysis of Nicklaus’ design work. Shaw’s Nicklaus is a useful supplement to My Story, diligently researched and clearly written, but between them we’re looking at a tome the size of War and Peace – a lot of words for what is, after all, a narrowly circumscribed realm of achievement. In an epilogue, Shaw compares Nicklaus to Tiger Woods, an inevitable and popular pastime these days, and bluntly insists that Tiger will never match Nicklaus’ record in the majors, an assessment he would probably like to re-examine after Tiger’s record-shattering win at the 1997 Masters. Nicklaus, writes Shaw, “simply played too well for too long” for Tiger to challenge his record. Even if, 35 years from now, Tiger’s biographers – which by then, if current trends continue, will number in the hundreds – do write of his eclipse of the records of that long-ago champion Nicklaus, it will not diminish in any way the achievements of golf’s greatest player, in the era known as B.T. – Before Tiger.